The project „Klimalog-research and dialogue for a climate-just transformation“ is now in its second phase. Main research areas in the current period will be: (1) Challenges for the implementation of climate policies in developing and emerging countries as well as scaling up ambitions, (2) resilience of vulnerable groups to climate-related risks, specifically in the least developed countries, (3) interlinkages between biodiversity and climate policies regarding both emissions reduction and adaptation to climate change, and (4) the role of subnational and non-state actors in global climate politics. 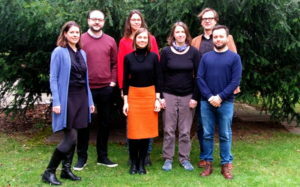 An international and inter-disciplinary team of seven researchers led by Steffen Bauer has taken up its work in January. The team will continue to monitor progress of the international climate negotiations. Further, research will be complemented by policy advice as well as dialogue events on specific topics promoting exchange between academics, decision-makers and implementing agencies. The project is funded by the Federal Ministry for Economic Co-operation and Development (BMZ) from 2019 to 2021.